It shouldn't feel like we're in a lull, should it? There is, however, just a hint of a lull in the air. We had that brilliant wave of warm weather and migrants came rushing in. It went from a bunch of the resident songbirds starting to warm up their pipes to flashy Yellow-rumped and Orange-crowned Warblers singing all over the place, Rufous Hummingbirds whirring by, and swallows darting over the local water bodies. We're past that now, it's quite chilly again, and I find myself waiting for the next wave of excitement. There are a few birds that could bring delight during this lull, but I haven't been into chasing them and I can't seem to find my own. This is the window that you can find Mountain Bluebirds and Townsend's Solitaires on rocky hilltops, estuaries, or open areas with lots of perches. Additionally, we're in that blink-and-you-miss-it frame where Say's Phoebes could be found. I have circumnavigated the airport several times, visited some unconventional hilltops, checked tree farms, and even visited sites that had Mountain Bluebirds a few days earlier, but I still haven't connected with any of them. Despite my lack of success in the bluebird/solitaire/phoebe department, I have managed to dig out a couple of birds that I am always happy to encounter. I have checked in on the flooded fields along Oldfield Rd. a couple times in the past week in anticipation of shorebirds rolling in. I am always greeted by Killdeer, but no yellowlegs or peeps yet. 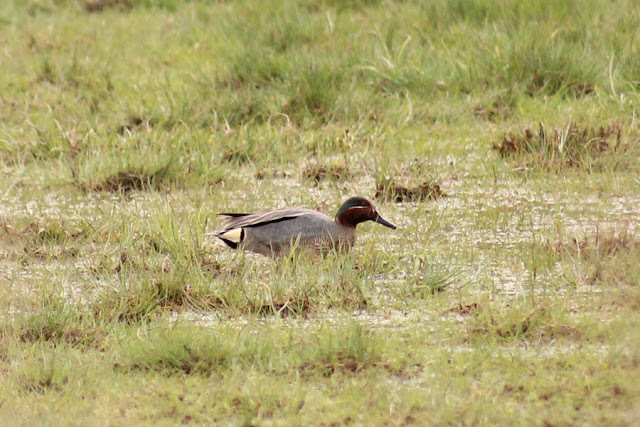 At this time of year, though, it is always worth sorting through the teal. Common ("Eurasian") Teal (Anas crecca crecca) is one of the birds I seem to have a knack for finding. I manage to find at least one every winter or spring at either Maber Flats, Tod Creek Flats, Panama Flats, or along Oldfield Rd. On April 8th, I had a rather striking male Common Teal flashing its prominent white stripe across its side, which is the result of the lower scapulars being edged in white. Our local Green-winged Teals (Anas crecca americana) have a vertical white stripe at the shoulder. On this bird, that mark is absent, but there is an obvious horizontal white stripe that is indicative of a Common Teal. Other features that point to this being the Eurasian counterpart to our local Green-winged is the courser vermiculations on the flanks, bolder white markings in the facial pattern, and the cream-coloured sliver in front of the vertical black mark near the tail. I went back to Oldfield yesterday in hopes that the rain had pushed down some shorebirds. We're still a touch early, but I thought it was worth a shot. The fields were very quiet so I headed back to the car. Just as I reached the car, I saw a Common Raven harassing a larger bird. The combination of the bird's shape and the location threw me off, so I raised my binoculars and immediately noticed a white tail base. As the bird banked, the wings showed immaculate white flashes. Picture perfect immature Golden Eagle! I went to get my camera as I was right beside the car, but the eagle decided to try to shake the raven. When I reeled around to snap off a couple shots, the Golden Eagle was no longer directly overhead and I had to try to get the shot through the trees. My manual settings were not ready for the backlighting, so it's really just a record shot of this unexpected beauty! 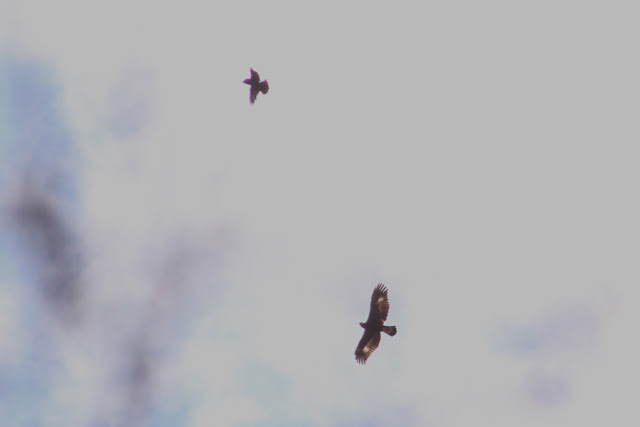 Even in this underwhelming photo, the white flashes in the wing and size compared to the Common Raven (top) make it easy to tell this is a classic immature Golden Eagle! So... when is this micro-lull over? I would say some time in the next week to week and a half. If you look back through the BCVIBIRDS archives - a very valuable resource - you can see that some of the good shorebirds should start turning up in a week or so. My fingers are crossed for a self-found Long-billed Curlew or Pacific Golden-Plover, but I am really hoping that someone will turn up a Say's Phoebe. That is my Victoria nemesis!